Here is Zeus enjoying his first Puppacinno at Starbucks on his 7th birthday on October 17th! I also make custom signs. I made the above Weimaraner sign (of course). They are done on painted wood, hand painted, distressed and waxed. I can add a rustic hanging wire on the top or on the back of the sign but they also stand on their own. The color of the background is also up to you! I’ve used Grey for obvious reasons. 😉 All lettering is hand painted. I also painted a Weimaraner head but that is optional. I’ve attached the picture of the sign I made. I sell them for $20 each. So, if anyone is interested, I would love to create something special for their home. Hello Weimlovers! Oh, and a Belated Happy Birthday Zeus! We wanted to pass along this information to all of you Weimar–addicts. (OMG) Well, you know what I mean. That Weimaraner sign is a must-have for many I think. (Haha) Of course, I realize you could do other breeds–but here we are all about the Weimaraner. Imagine that!?! All winter we found the Weimaraner soaking up warmth where they could find it. Fireside or atop a heat vent they clung to without shame. Of course, others were tucked in a blanket on the sofa, chair, or snuggled in their owner’s bed. It’s so sweet to have Mr. Sunshine here to take over for the winter heat source. Everyone in the Pacific Northwest and inland could not be happier to soak up the sun. Today, being the May Weim Gathering in Salem, we sincerely hope this weather holds for the fun event. Friends, fun, food, and the Weimaraner–what could be a better way to spend a Sunday? We are waiting for pups here just like you folks on our Wait List. I am out of easy posts for the blog, and I needed one this morning. I thought you might enjoy these photos pulled from the archives. A puppy fix never hurt anyone. He has been practicing his product presentation. He was particularly happy with himself when it came to Fortiflora and Zukes Minis. 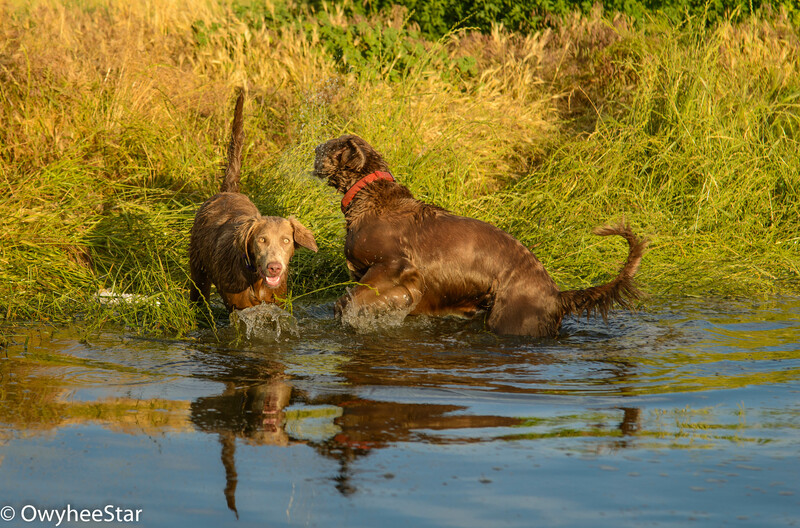 If you have been to the Vet for antibiotics or vaccine now is the time to add some good bacteria to your Weim’s gut. It would even be better to add some just before the vaccine. There are many times when the addition of some bacteria is a good idea. Yogurt (with live cultures) can be an option; however, it doesn’t come close to offering the same outcome. Keep this on your shelf. Click here to purchase from Chewy.com. The rain you folks posted (that live west of us) is here. It is nothing compared to the reports of what you got. We can also mention that we had a frosty morning last week, but again–nothing compared to the 13 degrees our friend from Baker City experienced. Hattee’s first litter arrived not long ago. The pups brought news that we exceeded the percentage of Longhairs. A few people celebrated that fact. Others were not so thrilled with the news. We needed a few Longhairs but learning that 7 of the 9 pups were affected came as a surprise. For so many, the idea of the Longhair is foreign. They came to the breed to escape the Labrador’s hair that has lingered in the cracks and crevices despite their attempts to remove it. The mere mention of more hair sets them on edge. Nonetheless, the Longhair is not leaving a trail of hair on the furniture, your clothing, and in the car. Yes, they do require a bit more grooming. Nevertheless, it is manageable. Even many naysayers have been infected –fallen for their cuteness. Here are the week’s posts if you wish you may review or visit them today! This week we find we need more light. I think we always can use light–in our soul and in the environment. Anyhow-out back there is a yard light, but in essence, it doesn’t give a person much help. Cliff and I purchased an inexpensive over the door light for out back. There was another man looking at lights. We discussed the lights, the choices, and the difficulty in finding something a person wanted. He was right, though. If there was only one choice then that is what you would get. Our front door on this old farm house has seen a huge change. It used to be located on the roadside–it had not been used as an entrance for years. We decided to move it to the east front corner. It all sounds so easy–right? Well, we had to close up the old door location and cut a new one. I think Cliff did a good job at the installation. He found a castoff piece of concrete to make the entrance better until we get pavers etc. It is a very simple solution. Every time Cliff mentions changing the siding I cringe. There is something that is heart-happy to my spirit. I think the home my parents built east of Springfield near the McKenzie had this type of siding. It holds memories of my earliest remembrances. So, this is the home Cliff grew up in but it reminds me of my childhood too! I love the cottage feel and look. Marilyn posted a lovely (and very inviting entry) and it made me think we needed to do a little something. So, we added a planter by the door and the welcome sign. I sincerely hope in the next couple of years that bigger change will happen, but I am content with what have done to the entrance for now. There is no way we could ever thank you enough for your love and support. We are immensely grateful for those who continually provide us with the material for the blog. Unfortunately, sometimes this is only photos and no script. We can fill in a bit when necessary; however, we like to keep the integrity of your writing real. A couple of sentences can go a long way–sometimes it is enough. Those that have sent us updates know we are more than likely to post it word-for-word. There is no end in sight of our farmhouse remodel. We are doing it ourselves, and it is the installment plan–we are not borrowing to do this. We buy something and install it. Therefore, having the updates is greatly appreciated than usual–it is always a blessing! Shela, it is ____(fill in the blank). It has been so long since I updated you as to this beautiful and fantastic dog (your pet’s name here). He was born ____. You bred him perfectly. I wanted to thank you, and impress upon you and Cliff to please keep us in mind down the road. Your genuine care and expertise certainly blessed us with an incredible dog. The above excerpt extracted from a recent note is commonplace to our email. In a future blog, we will be using the expanded note for a blog. Nonetheless, we wanted to make use of the sentiment for today’s blog. We get a lot of emails that say something similar. We even get inquiries from people we have never met that ask us to keep them in mind. (Whew) Even though the comments warm our heart, we cannot keep track of all the people that write to us hoping we will just think of them. We could easily have several hundred persons on the Wait List at any one time. The reason we do not is the change we implemented about 15 years ago. We require a small (non-refundable) deposit to get on our Wait List. Before then, we often ran with a hundred plus names on the list and worked our way through the list each time pups arrived. Many on the list never replied. Others never spoke to us again once we asked for a deposit. This deposit requirement changed things for us. It meant we could spend our time on what is most important–the puppies and those who are committed to getting a pup from us. We also have a small personal life. (Haha). A lot of folks make a comment about us asking them to complete the application. The application is how we gather all the information to determine if we are the right breeder and if we would be interested in placing a pup with you. It also is a systematic way to gather the much-needed information for our process–your contact information, who lives in your home, and what expectations you have for your relationship to the Weimaraner. At the same time, we spend a considerable amount of time and effort sharing pointers and tidbits of information that help ensure the puppy placement’s success. A goodly portion of our Wait List comes from referrals as well as repeat business. Even then, a fresh application is of vital importance. We still require a small deposit to get on the Wait List as well as the puppy deposit. To the OwyheeStar savvy person, this seems reasonable and is to be expected. For those who has never experienced this type of process, it might seem a bit crazy. Regardless, it works. We cannot thank our puppy families enough for their trust and loyalty. If you are new to the process, it is important to understand that this works the same for everyone. Secondly, it is not only in the best interest of the puppy but you. It was a long shot that Wilma would do anything at the hunt test. Nonetheless, a last-minute change was in order. We scrambled to make the necessary changes, and Cliff took her. This trip will prepare her for the fall hunt tests. We hope to gain entry into that test. Wilma was phenomenal, and she aced the swim. Other sections of the test were not so stellar, but consider that she had not seen the field, a bird, or the pond before Monday. We had been planning to go another direction when it became apparent this girl had a pocket of ability, and the temperament we like so much. Note about the Video: The following video is not edited. Wilma’s run is quite a way down the line. This is a GoPro video taken by Cliff of the Treasure Valley NAVHDA Hunt test. As you can see, no one is noticing he is filming. He has the camera strapped to his chest. He doesn’t always get the exact shot he hopes for, but this will give you a feeling for what is happening. Keep watching, and you will catch a glimpse of Wilma’s smooth-sailing swim. Friday was her first “true-swim”, and it was more dog-paddle splashy. At the Hunt Test, she looked like a pro, and swam with ease almost on command earning her 4 of 4 possible points. You can achieve the swim too…. Wilma with Stackhouse soaking wet from time in the pond…..
Getting the Weimaraner to swim can take patience. A little knack, and good fortune can help along the process. We hope you enjoyed this two-day adventure. Yesterday’s blog showed the beginning. Thanks for your interest, and joining us on Wilma’s lesson in how to swim. Isn’t spring grand? It does bring its own set of demands. Cliff was pressed on every side this week. He has not farmed the second half of our property in recent years; however, last fall he put in winter wheat on the east parcel. It is coming along nicely; it required irrigation (for the first time this year) this week. Getting the water going took some concerted effort. He has had to revamp everything to work for how we will be doing things. Isn’t that the way it goes? Anyhow, he got the wheat watered. Beyond the farming, he is preparing for spring hunt tests. He has a couple of Weims to get ready for the spring hunt tests. We will see how it goes; he only has one girl who fits the time frame for the NAVHDA N/A (North American Versatile Hunting Dog Association Natural Ability) hunt test. He hoped to put more time into her, because she has hunt-potential-promise, but it takes patience to develop a good hunt-performance. This is true, even though it is known as the natural ability portion of the NAVHDA testing process. 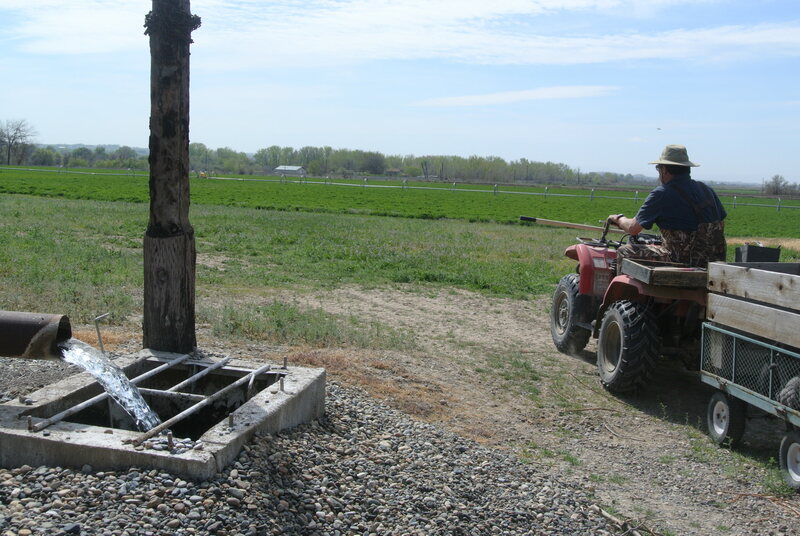 It requires exposure to birds, field conditions, and water prior to the test. The pup must be ready to perform to a certain level. 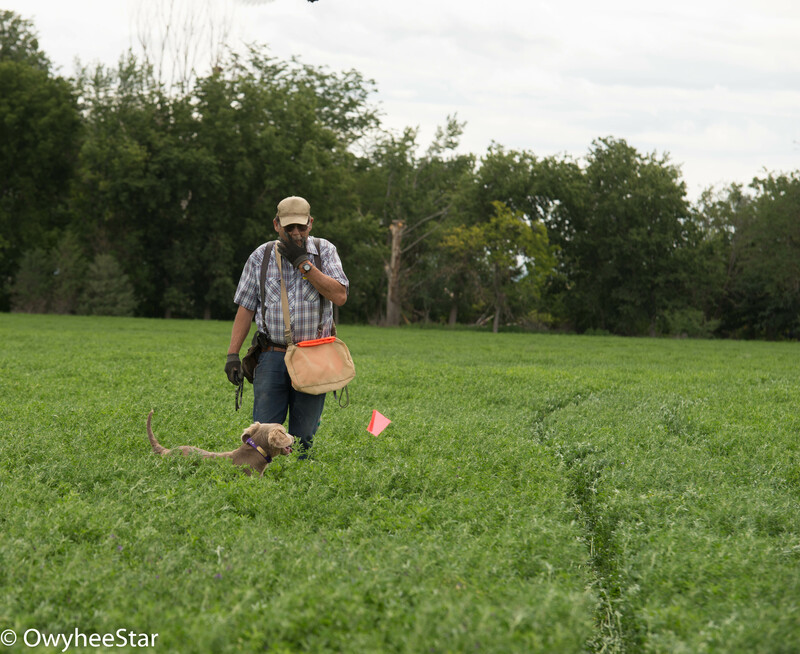 We mentioned the time frame for NAVHDA N/A testing was limited, but the Versatile Hunting Dog Federation (VHDF) has a much more doable set of age requirements. The VHDF Hunting Aptitude Evaluation (HAE) which is similar to the NAVHDA N/A doesn’t restrict participation due to age. In many cases, this can be a huge plus. Some Weimaraners (and other breeds) will mature later than others; it can be difficult to have a pup ready in the exact NAVHDA test time frame. Both venues have a lot to offer a dog breeder, as well as someone wanting to develop a serious hunting companion. Here are the links for this week’s blogs…. Friday’s blog featured the puppy swim. The (Blues in the Wagon) photos we posted on Facebook were a hit with you, and others. There are a few blog subscribers who don’t get on Facebook; therefore, we will post these cute faces for you again. We don’t think anyone will mind. I am heading off to bathe two of these pups that will depart for their new family today. Others will be leaving soon. We have a couple left to place, but inquiries have been consistent. Although we have a waiting list, each person on it has their own agenda. This includes coat color, time frame, and other factors. Placing the pups in the best possible home is important to us. We believe it is a breeder’s duty to care about where the pups go, and what happens to them. ~Thank you for being a part of our lives!